36×48 in. Oil on canvas by Hall Groat Sr. Round Lake can be reached by trail from Green Lake. (Very Short Walk)—All part of Green Lake State Park. I have been painting pictures of these two Lakes since my art student days at Syracuse University. Painting all four seasons keeps me busy. I actually prefer the winter scenes best. If you will notice in my painting, there is strength in my composition. 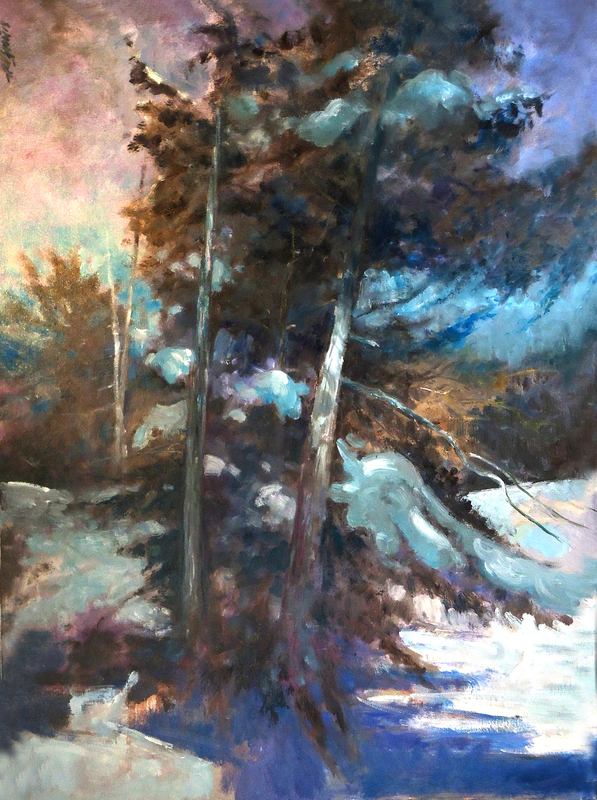 The stark difference in contrast between snow and tree branches allows me to concentrate on basic forms. Therefore, I need not paint so many tree branches and find the process more enjoyable. Enjoyment equates to success in art. I hope you will also enjoy my painting in morning light as much as I have enjoyed painting it.